Thanks to all of you who entered our giveaway. We had a lot of fun doing this. Hopefully more to come soon. Country Cream® Instant 100% Real Non-Fat Powdered Milk, Dutch Milk Chocolate drink, Soy Milk, Chocolate Soy Milk and MilQ milk alternative whey drink are the country's best in powdered milk products. Voted number one in taste tests with other national and local brand milks. It tastes SO good. Powdered milk has gotten a bad rap over the years. 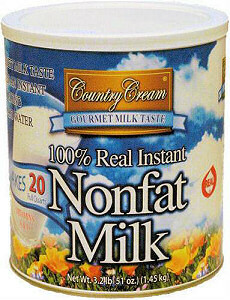 Country Cream Milk is made with real milk and does not have that nasty powdered milk taste we have grown to despise. (The chocolate milk is like a dessert in a drink) Yum.